Symone Abbott jumps for a spike. The senior outside hitter and the Wildcats went 2-1 at the VCU Invitational. Northwestern had another successful showing this weekend at the VCU Invitational, but it didn’t come without a bump in the road. The Wildcats (10-2) cruised past Seton Hall and Bowling Green before losing to the hosts to close their nonconference season. 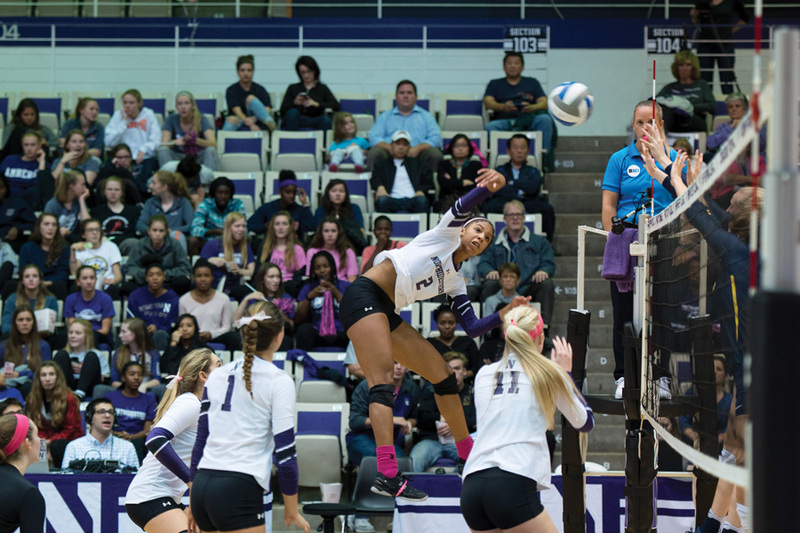 The loss to VCU also snapped NU’s nine-match winning streak. The Cats beat the Pirates (6-7) 25-21, 25-21, 25-14 to open the weekend. Senior outside hitter Symone Abbott had a game-high 16 kills and senior middle blocker Gabrielle Hazen posted a .538 hitting percentage, also a game-high. Hazen attributed NU’s strong start to teamwork. Against the Falcons (4-7), the Cats dominated again, winning 25-21, 25-12, 25-16. Abbott again led the way with 14 kills, and freshman outside hitter Nia Robinson tallied eight kills. Senior setter Taylor Tashima had her fourth double-double of the season, finishing with 31 assists and 21 digs. Hazen said Robinson, who is currently sixth in the Big Ten with 3.63 kills per set, has taken pressure off Abbott. Abbott, for her part, is second in the Big Ten with 4.43 kills per set. NU fell to the Rams (13-2) in its nonconference finale in straight sets, 25-22, 25-23, 25-17. Abbott and Robinson each had 10 kills, but the Cats posted a dismal hitting percentage of .107, their lowest output of the season. Despite the loss, Hazen said NU is confident heading into its conference slate.